E3/T3 Fiber Optic Modems (FH-E and FL-E) convert an E3/T3 copper interface to fiber optic signals and vice versa. One of the modems's advantages is data transparency, which allows application independence and flexible deployment. The benefits of fiber optic technology ensure low bit error rates, high reliability, galvanic separation of the modems and high transmission distances. The FH-E and FL-E are used in WAN environments where the interconnection of LANs is necessary. In these applications the modems serve as an E3/T3 extension. Furthermore, the modems allow the point-to-point connection of PDH multiplexers via fiber optic cables. Local and remote loops can be activated by pushbuttons providing a suitable tool for error source isolation. For monitor and control purposes, a control processor is available which can be accessed via VT100 or SNMP. The optional Fiber Doubler increases the existing cable capacity by transmitting and receiving data on a single fiber instead of two. 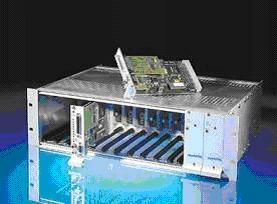 The FH-E and FL-E modems can be offered as standalone units or as rack mount cards supporting the universal rack concept.